help you to exhibit your collection in style. 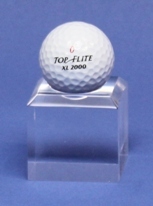 These are also excellent gifts for golfers to display balls they collect from tournaments or courses they have played. Purchase any multi item display case and receive the engraved nameplates - plaques as you need them and they're still FREE!!! 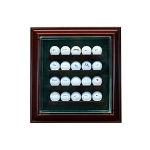 EXAMPLE - Order a golf ball display case that holds 20, 50, 80 100 balls or more. You may only have a few balls for it now and don't need all of the nameplates right away. and we will promptly send them to you for FREE!!! The same offer stands for any display case. Baseballs, Footballs, Diecast Cars, etc. Single golf ball display case - dome with walnut base and custom ball holder. The round shape of this dome is a nice change from traditional squared edges cases. Price includes 1 free nameplate. The nameplate is made to conform to the round shape of the dome. (98% UV resistant) door that keeps inquisitive fingers away, as well as dust! locking door latches and installed wall hanging hardware. The ball holder is not attached and does not need to be used. 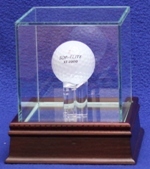 Single golf ball glass display case - dome with choice of hardwood bases. Features gold colored custom golf ball holder - stand. Dome measures 4" x 7"
investment in the protection of your memorabilia collection. Price includes 1 free nameplate. Nameplate is super flexible to perfectly conform to the shape of the dome. clear real UV protected glass and a mirrored back and floor so you can see the entire ball. sized to hold a golf ball. Includes 1 free nameplate. nameplate/plaque please see Item Code: GOLF-201. Interior Dimensions 3.5" x 3.5" x 3.5"
mirrored back and real UV protected glass. Includes 1 free nameplate. Interior Dimensions 4 x 4 x 3-1/2. Our unique hinged design allows for easy access. Mounting hardware is included. clear real UV protected glass, custom tri-pylon stand and mirrored floor so you can see the entire ball. 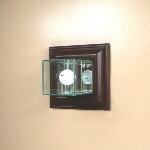 Wall mount single golf ball glass display case featuring a furniture grade wood frame, mirrored back and real UV protected glass. Interior Dimensions 4 x 4 x 3-1/2. Our unique hinged design allows for easy access. Mounting hardware is included. Brass display stand designed to hold a single golf ball. The ball sits on stands shaped like mini golf clubs. Also available for a baseball or tennis ball. Now display your golf ball like never before, in the absolutely incredible floating case. Acrylic custom made T-Cup display stand for one golf ball. Very unique item. Looks great on an office desk or book shelf. 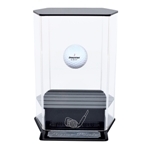 Acrylic custom made T-Cup display stand with base for one golf ball. Very unique item. Looks great on an office desk or book shelf. and no more than 20 character/spaces per line. 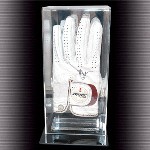 Single golf ball hole in one acrylic display stand. The ball sits in a custom designed holder on a gold colored #1. The base has a black marble finish. Price includes 1 free namelate. 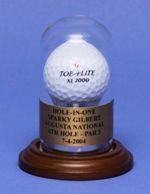 Acrylic display stand - holder for a single golf ball. It's unique 3 wing design holds the ball securely, but still allows for full viewing of the ball. This unique golf ball or handball display holds a single ball using two screw down rods. The rods are rubber tipped so the ball does not get marked. The entire display is metal with a gold color plating. 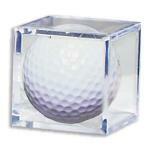 Single acrylic golf ball square display case cube. Holds 1 regulation size golf ball. display case, nameplate engraving is limited to 20 characters per line. THIS ITEM WAS FORMERLY A 6 PACK BUT IT IS NOW A SINGLE CASE ITEM. to form a Tri-Rod display stand. Diameter is 1-1/4" and height is 1-1/2"
the ball sits in. Overall dimensions are 1-3/4" x 1-3/4" x 3/4". Comes with 1 free name plate. Due to the size of the engraving area 1-3/4" x 1/2", please limit characters to 25 per line and 2 lines. the ball sits in. Overall dimensions are 2 x 2 x 2. Comes with 1 free name plate. Due to the size of the engraving area, please limit characters to 20 per line and 5 lines. A full door keeps inquisitive fingers away, as well as dust! a stunning display. Shelves have indentations to secure golf balls. Completed with a crown trim design base and header. Brass hinges and door latches. Wall brackets to hang or free standing. (balls are not included). This is a high quality investment in the protection of your memorabilia collection. If no nameplates are wanted, simply leave that field blank. 20 golf ball glass display case. This display is similar to a traditional shadow box, but without the shadow. The other products that are out there keep the golf balls enclosed in a box. are staged pictures with lighting shining into the shadow box creating an illusion of natural lighting. 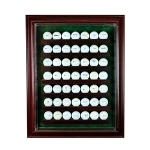 49 golf ball glass display case. This display is similar to a traditional shadow box, but without the shadow. Space between Shelves: 1 7/8"
Price includes 63 free nameplates. Additional nameplates are available. Price includes 70 free nameplates. Additional nameplates are available. Price includes 108 free nameplates. Additional nameplates are available. cover with a static free cleaning cloth. quality investment in the protection of your memorabilia collection.